Skåne, Sweden's most southerly county, offers beautiful rural landscapes with plenty of scope for a canoe adventure! The region is wonderful for paddling and Canoe Getaway in Skåne can be reached in just two hours by hourly public transport connections from Copenhagen, making it a perfect choice for a weekend escape for couples, families or groups of friends! Your tour takes you along Holjeån on a river trail which stretches from Östafors in the north to the lake of Ivosjön in the south. The river offers leisurely paddling in lovely countryside through the Holjeå valley region and has an almost tropical feel. 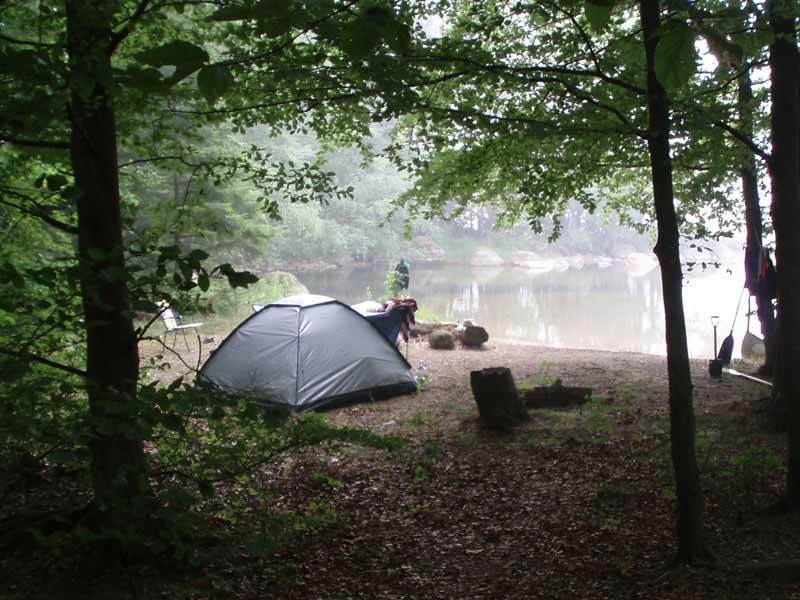 Camping equipment is provided for overnighting at the network of camping spots. Photo: WL. The water is relatively clear and the river varies between sections of rapids (you do not pass these on the standard route) and gently-flowing sections. The river opens up into the Ivo Lake archipelago, a beautiful lake dotted with islands ideal for exploring and camping. Overnights are wild camping and there is a network of designated spots to choose from (tips will be given at the start of the tour) - fireplaces are provided at the locations for preparing food and enjoying a cosy evening by the fire! With distance to cover flexible, the tour is ideal for adults or families. Photo: WL. Lake Ivo is also rich in birdlife, with possibilities to see a variety of species including osprey, hobby, black-throated diver, common crane, grey heron, common sandpiper, great crested grebe and common tern. The total minimum distance from start to finish is just 12km, but the lake area offers great flexibility to do as much or as little paddling as you wish during the tour with plenty of possibilities to plan your own exploration of the lake area and create your own adventure. Alternatively, use some of the time to explore some of the wonderful hiking trails or perhaps a little fishing. 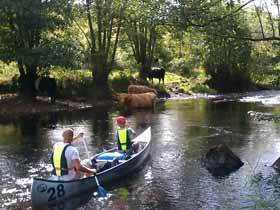 Canoe Getaway in Skåne is ideal for adults or families looking for an accessible, flexible canoe tour in an attractive rural area. Camping equipment (tent, sleeping mat, toilet spade, saw and axe, rubbish bag, fresh water container, camping stove with fuel) is included as standard and provisions can be purchased locally before your tour. Paddle three persons in one canoe. Note of course that this will limit space for packing. Extra person paddles own canoe. If you have not paddled before, this can take a short time to get used to, but otherwise presents few problems. Bear in mind that paddling solo will add to the level of challenge, especially in windy conditions. Arrive to the canoe centre in the afternoon, latest 17.00. The surrounding area offers good possibilities for hiking trails, or you can choose to do an evening paddle tour on the lake. Overnight in tent at the canoe centre. Toilet, fresh water and barbecue area are available. Transfer to the start point of your canoe tour at Västanå mill. 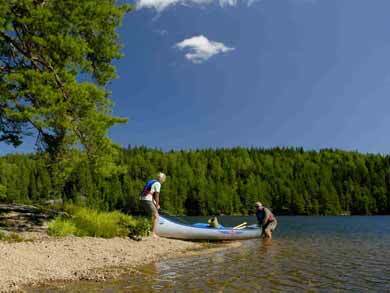 Today you paddle the Holjeån water trail through an attractive rural landscape of fertile countryside around 6km to Lake Ivo, which offers good possibilities for paddling in a more open, lakeland landscape and for fishing. Begin your exploration of the lake area in the second part of the day before choosing an overnight spot to pitch your tent on one of the islands in the lake. NB: If water levels are suitable, you can also choose to be transported 6km further up river to begin your tour at Östafors. However, water levels cannot be known in advance, so arrangements for this must be made locally. This stretch offers a landscape of rolling countryside, agricultural land and beech forest. An additional local transport fee (75 SEK, about £7/person) will apply. There are some rapids on this section which you will need to lift the canoe past. This then gives a paddle distance of around 12km down to Lake Ivo. This day offers the flexibility to do as much or as little paddling as you wish, as you explore Lake Ivo - how much time you choose canoeing, swimming, or simply relaxing and enjoying the view is up to you! 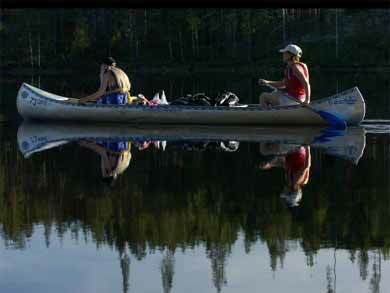 If you have chosen to add an additional day to your canoe tour as an optional extra, you can continue to explore the lake area with another night's camping before returning to the canoe centre. 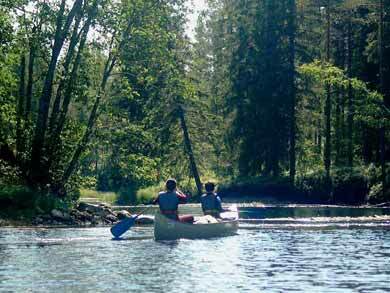 You paddle to the canoe centre on the shore of the lake, where your tour ends. Depending on the time you have available this day, you can choose to have a full day's canoeing on the lake or simply take the shortest route back to the canoe centre to end earlier if you are travelling home. Please return to the canoe centre by latest 16.30. Start any day by arrangement between start 10th May and 22nd September between 09.00 and 17.00 (last start 22nd September; note that you should be prepared for lower temperatures if travelling at the beginning/end of the season). Duration: 4 days/3 nights (option to extend to 5 days/4 nights). Prices are in British Pounds and Euros. If you wish, you are also welcome to make your payment in Swedish Kronor (SEK) - please contact us for details. *For other options for odd-numbered group, an extra tent is not provided - extra person will share tent with other participants. Group rates are available for groups of more than 10 persons. Please contact us for details. Extra night at campsite: You are welcome to camp at the canoe centre for a night after your tour ends before onward travel. Includes use of camp facilities and extra night's hire of camping equipment. Note that you should return your canoe equipment at the end of your tour - canoe hire for extra night is not included. Extra canoe tour day: Extend your trip with one extra tour day (making total 5 days/4 nights with arrival day + 4 days/3 nights canoeing). Price includes canoe and camping equipment. Canoe equipment: Canadian canoe (2-3 persons, normally Linder 525), buoyuancy aids, paddle, pack barrel (60 litres, one per canoe). Foam sleeping mat (please bring own sleeping bag and sleeping sheet). 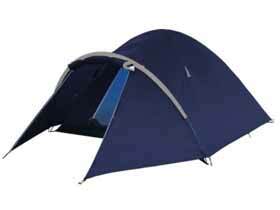 Tent* (2-3 persons). Tents provided are simple tents suitable for the tour, with inner/outer tent layer and area for storage of packing. 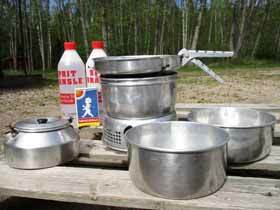 Trangia-style camping stove* with fuel (please bring own camping plates and cutlery). Saw and axe for firewood. One sack of wood per canoe is also included for use at the overnight stops. Transfer: Local transfer between canoe centre and tour start point. Travel: We do not arrange flights or domestic travel, but are happy to advise on suitable connections and assist you with any aspect of planning your journey. See under "Getting There" for general travel information. Provisions (can be purchased locally). Simple fishing equipment and licence can be purchased locally. As an alternative to camping, the Lake Ivo area also has the possibility to overnight at guest house/hostel accommodation for one or more nights (arranged locally on arrival). Suggestions will be given in tour information. Min. 2 adults required*. General good health and level of fitness. Participants (including children) must be able to swim and enjoy the outdoors. No previous experience required. Recommended minimum age 6 (younger children may be possible by arrangement). *This tour can also be suitable for solo adult + child(ren), depending on ages of children and previous outdoor experience. Please contact us to discuss your requirements. As a self-guided canoe tour of short duration and with flexible route, you can vary the distance covered and level of challenge as you wish. The network of camping locations makes camping straightforward. Level of challenge will be higher in windy conditions and the lake can be choppy. NB: Perception of difficulty is very subjective. What is hard to one person may be easy for another and vice versa, depending on factors including level of fitness, age and previous experience. Weather conditions/temperatures can also dramatically affect the actual level of challenge encountered. For information on any equipment and/or clothing included as standard for this experience, please see under "What's Included". A detailed recommended packing list for personal items to bring will be sent with your booking documentation. NB: We advise you not to buy equipment or clothes for your trip or to incur other non-refundable expenses such as flights until you have received confirmation of your booking from us in writing. Note of course that the most appropriate clothing to use as well as the level of challenge experienced during any outdoor activity may vary significantly depending on factors such as the time of year and the particular weather/temperature conditions during your trip. For further reading, we also have a number of general information articles to get you ready for your trip, covering a wide variety of topics from what to do on a city break before/after your tour, advice on packing, eyewear for winter and considerations for female travellers. This experience is ideal for groups. Please contact us to discuss your requirements. This provider has a written environmental policy. Detailed information on travel options to this experience will be provided in response to your enquiry. We are happy to advise on suitable connections and assist you with any aspect of planning your journey. Please ensure that you make a booking with us first and wait for confirmation that your spaces are reserved before making any travel arrangements. Fly to Copenhagen for direct train (1 hour 45 mins) to Bromölla and local bus (15 mins) to the canoe centre. Ferry Dover-Dunkirk or Newcastle-Amsterdam for onward train connections to Bromölla. Compare our range of canoe tours. Read a trip report from Bob on the Nature Travels blog.